These lamp ready Vapor tight fixtures and come pre-wired to operate with standard single ended LED T8 Lamps. 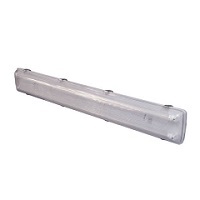 They are IP65 Rated and are ready for installation as new or remodel fixtures. engineered to operate the latest single ended LED T8 lamps on the market. Lead wires are 7’ for tandem wiring, eliminating back and end knockouts. Polycarbonate Grey Housing and clear lens standard.